2009 American Society of Agricultural & Biological Engineers (ASABE) Annual Meeting – Chris Renschler and Dennis Flanagan receive the ASABE Superior Paper Award. 2007 Soil Science Society of America (SSSA) Annual Meeting – Chris S. Renschler receives the SSSA Soil & Water Conservation Young Scholar Award. 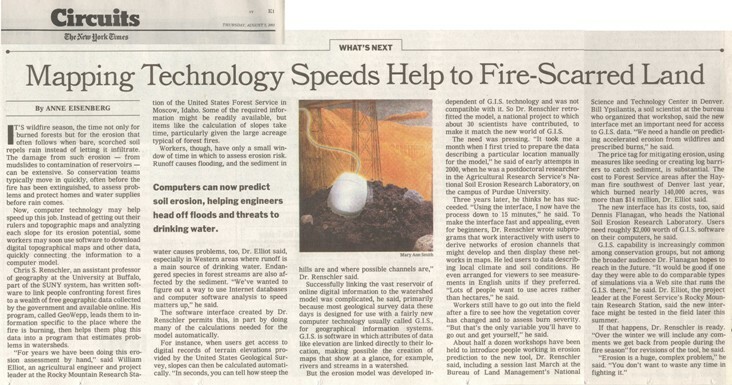 2003 New York Times (August 7, 2003) – Click image to view the article online.